*For an updated version of this dish please see my 2015 post. It’s a Mexican chilli dish made with slow cooked shin of beef rather than minced steak. I’m a HUGE fan of shin beef, and cook with this cut regularly. 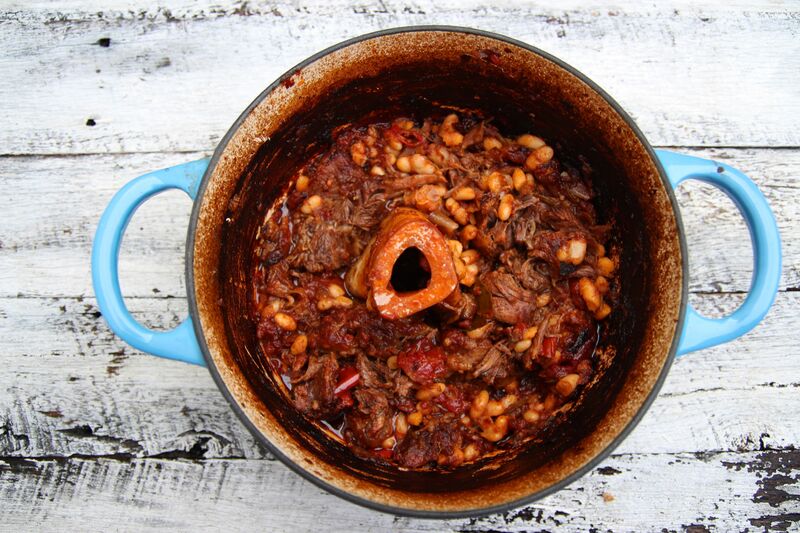 It’s perfect for casseroles and stews, any dish that needs long slow cooking. 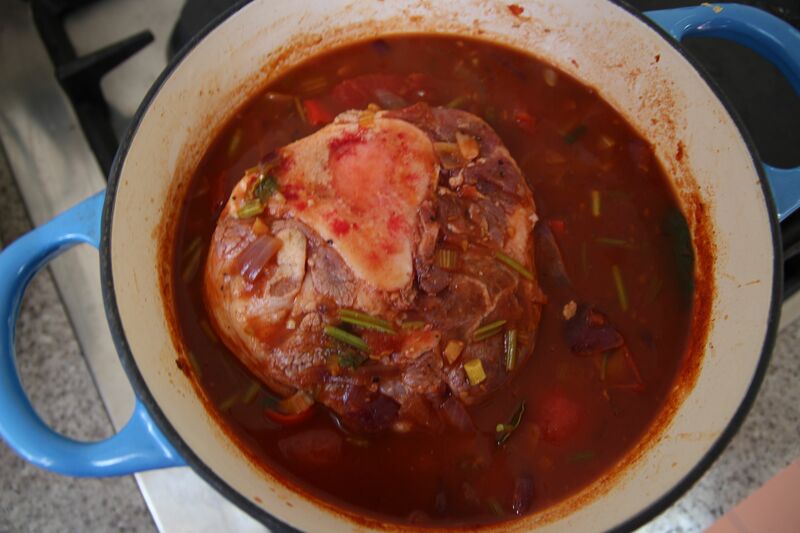 In this recipe Jamie cooks the beef bone in, in one piece. This creates a real depth of flavour. At the end, when removing the bone, you scrape out the bone marrow into the dish for that extra burst of flavour. It’s a really easy dish to prepare – nothing complicated – but it takes time. 5 hours cooking. Perfect for a wet weekend when you are staying indoors anyway. My comments are that I lowered Jamie’s original oven temperature of 170 degrees C to 150 degrees C. If you are cooking for 5 hours you want the temperature nice and low. Also, my casserole was not as “liquidy” as Jamie’s. Next time I will add a little more water or some more tinned tomatoes to the mix, or cook for slightly less time. Rock salt and freshly ground pepper. Heat a large heavy bottomed casserole on the stove top on a medium heat. Add swig of olive oil to the pan. Add chopped red onions and minced garlic and fry for a couple of minutes. Add chopped chillis and the roots and stalks of the coriander, leaving the tops for the salsa and garnish. Add the spices and a good grind of salt and pepper. Fry till the mixture is caramelized and gnarly, but not burnt. Pour in the chopped tomatoes, fill each tin with water and add these to the casserole. Stir to mix, making sure you gather up all the goodness at the bottom of the casserole. 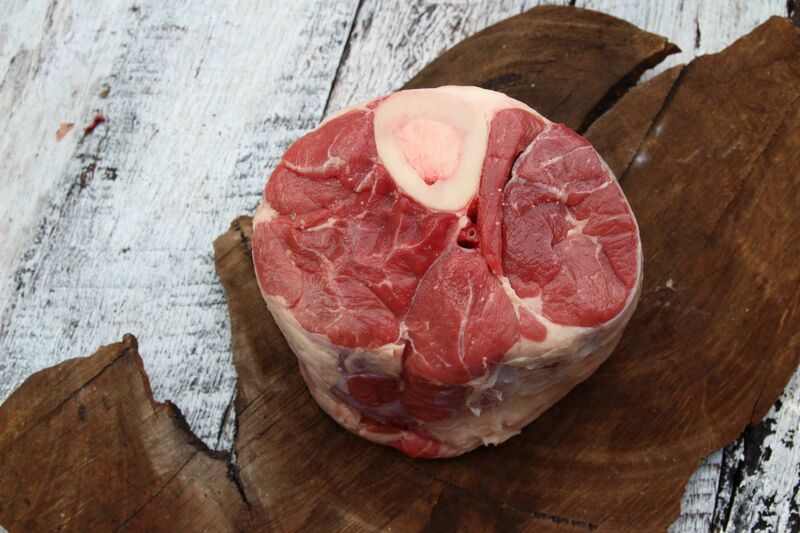 Roll the shin of beef in salt and pepper to coat, then place gently in the centre of the casserole. Turn to coat in the liquid. Pop the bay leaves into the mixture. Place the lid on the casserole and move to the pre-heated oven. Cook for 5 hours. I suggest checking after a couple of hours, and then each hour, to make sure the liquid is not drying up. As I mentioned, my chilli could have done initially with more liquid, or half an hour’s less cooking time to retain more moisture. Meanwhile, empty the tin of cannellini beans into a frying pan with a swig of olive oil, and fry for a couple of minutes until some of the beans split. Remove the casserole from the oven, and add the cannellini beans. To make the salsa, blitz the green pepper, spring onions, cherry tomatoes and most of the coriander tops in a food processor. Put into a bowl with a splash of extra virgin olive oil and white wine vinegar. Serve the Mexican chilli with the salsa, fluffy rice and yoghurt, and coriander leaves to garnish. 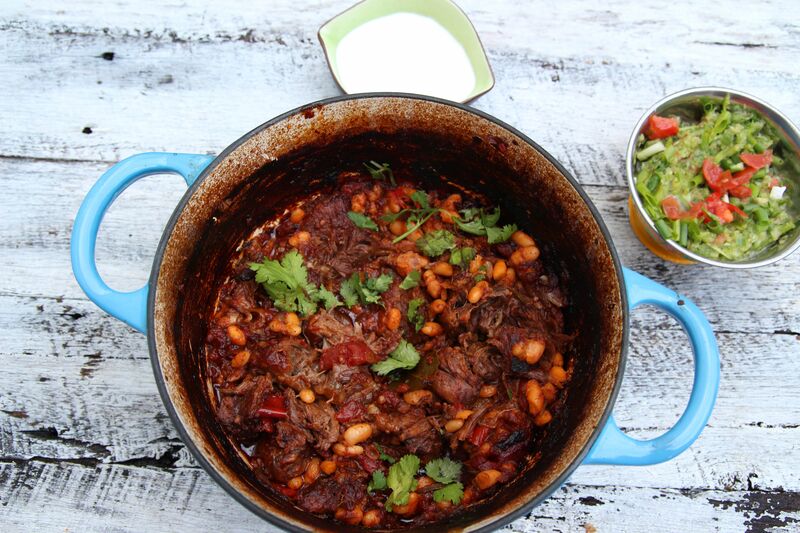 Posted in Jamie Oliver, Savoury Food, Slow Cooked Food and tagged basmati rice, cannellini beans, casserole, chilli, Jamie Oliver, Mexican, salsa, Save with Jamie, shin beef, yoghurt. Bookmark the permalink. Would you recommend doing this recipe in a slow cooker?? If so what sort of timings etc would you recommend? Would you alter the recipe? Hi Adam, I haven’t used a slow cooker – I have been meaning to get one for ages! Looking up the internet leads me to believe that the slow cooker would work well. The long cooking time would be good for the slow cooker method. I would definitely put more liquid than Jamie suggests – as I said in my post my version was a bit dry. And slow cookers rely on having a lot of liquid to gently simmer the food. Hi, I make this in the slowcooker all the time.Just do not add the 2 tins of water. I added half a glass of Red wine instead. Cooked on Low for 8 hours. I have also made it with Stewing steaks and it is just as good. Made this dish today. Strangely mine was too liquidly. Looked more like a soup. Wonder what we did different? I made this recipe in my slow cooker today, started with a large pan on the stovetop and once I got to the point of adding the meat I transferred to the slow cooker. I cooked it for 6hrs on high (using my grandmother’s original crockpot, not sure what the settings are on newer varieties!). The meat was perfectly tender and falling apart but the sauce was too liquid, I ended up transferring back to the stove top to simmer and thicken for an hour before serving. Yes same here. Sauce needed reducing. If using slow cooker maybe just use the 2 tins of tomatoes and just a little water to rince out tins. Very enjoyable. Made it last night and was very nice, although if I were to make it again, I would use half the amount of coriander. I found that I could only taste coriander, maybe it’s just me but Jamies cooking seems to have a lot of it. After 4 hrs cooking I did notice that it was more like soup than chilli, I took the lid off for the final 40 minutes for perfect consistency. regards and thanks for posting this recipe. Hi Iain, glad you liked the recipe. The cooking time is still a bit of a mystery to get the right consistency – I’ve had too little liquid and also too much – but I guess you can control the liquid by checking the casserole after a couple of hours and then making adjustments. Hi I just finished a batch and I made double the amount that Jamie did. Everything turned out perfect.icooked it for 5hours exactly. I’m so glad it turned out ok! It’s a great recipe for slow cooked beef, but I’ve had a bit of feedback from people who have had trouble with the recipe. And you’re keen to stay up till 3.00am to finish the cooking! Thanks so much for the comment. Cheers, Inga.